Ahead of their semifinal matchup on Sunday, Oct. 25, first-place Stony Brook Women’s Soccer took home numerous honors as the America East Conference released regular season awards on Wednesday, Oct. 24. The team’s coaching staff was awarded the America East Coaching Staff of the Year honor after a dominant 6-1-1 conference record and 11-6-1 overall, an improvement from last year’s 11-11 record. The Seawolves are heading into the America East playoffs as the top seed for the first time in their program’s history. Senior forward Julie Johnstonbaugh was awarded first-team honors by notching nine goals and an assist in her final season, tying with sophomore forward Alyssa Francese for the team-high in goals. She also scored five goals in the team’s final five matchups, including two against Binghamton on Oct. 4. 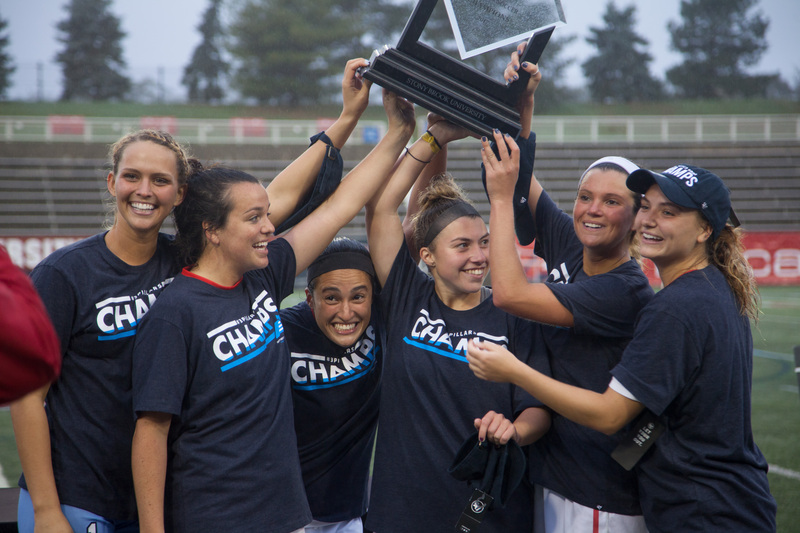 Johnstonbaugh also led the league in game-winning goals with five, highlighted by her senior night header in overtime followed by her engagement. Sophomore goalkeeper Sofia Manner picked up first-team honors as well as America East Goalkeeper of the Year. The Finnish keeper, who was last year’s Rookie of the Year, continued her dominating play by ending the regular season with a 79 percent save percentage and seven clean-sheets, both conference-highs. Francese’s performance this season placed her in the America East Second Team along with senior defender Kaitlin Loughren and sophomore midfielder Kimmy Chavkin. Francese scored nine goals and was credited for an assist this season. Her, as well as Johnstonbaugh, tied sixth in the conference in points with 19. Francese was also awarded for her work off the pitch. Her 3.78 GPA in the classroom gave her a spot on the America East All-Academic Team. Stony Brook led the second-team in selections with three players chosen. Loughren made the conference second-team for the third straight season. The senior started in all matchups for the Seawolves and dished out two assists. Loughren was part of a defense that allowed just 20 goals this season, the second lowest in the conference behind Hartford, who allowed 15. Chavkin totaled for the second-most team minutes behind Manner with 1547. She scored once and assisted on five goals this year, including the second goal of her Seawolf career in a 4-0 victory against Vermont on Sept. 30. Freshman forward Tatum Kauka was named to the conference All-Rookie Team. She scored two goals for the Seawolves and bagged an assist in her debut campaign. Kauka picked up the first point of her career with an assist in the Seawolves 2-1 victory over Oregon State on Aug. 19 and her first career goal on Sept. 9 in a 4-0 win over Wagner. Stony Brook prepares for their America East Semifinal contest against the winner of the Vermont-UMass Lowell Quarterfinal. Kickoff for Sunday’s matchup is scheduled for noon and will take place at the Kenneth P. Lavalle Stadium, where the team has an undefeated record of 6-0-0.